"I Could Read This All Day"
At this point in time if He-Man is forever doomed to live out his life in DC Comics crossovers I will happily keep signing up to buy them. I may be in the minority of comic fans in that regard but I just find something fun about the 'back in the toy-box' feeling I get when DC Comics decides to go into the grab bag of properties at their disposal and pull one of these out for a mini-series. So now that we know I'm a He-Man 'stan' lets get into the first issue of He-Man vs 'bad' Superman and see what comes out the other end. Things start with Zodac, basically filling the Mobius role, throwing us into the story as a nice gentleman would. 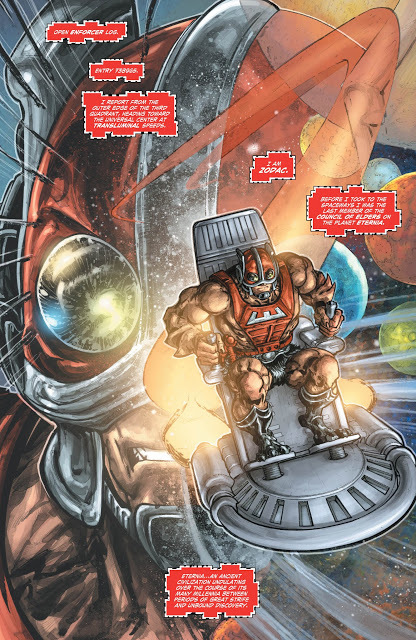 From there we waste no time at all joining a story already in progress with He-Man in battle bringing things to a conclusion revealing Faker involved in the latest events happening for the last 3 months on Eternia, assuming He-Man's role. 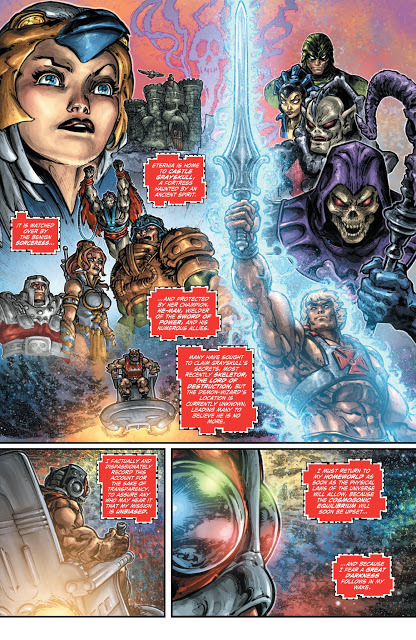 However with He-man back in control now some of the citizens in the 'more vocal minority' aren't happy that the He-Man back in power isn't always his all-powerful self, throwing his weight around. As He-Man debates his moral quandary from the luxury of his balcony he's greeted with a surprise visit from some of DC's finest who have allied with Batman. 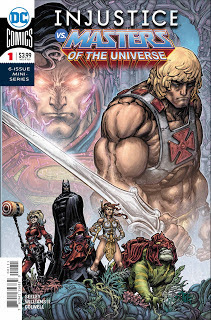 Batman, Swamp Thing, and company fill in He-Man on why he's needed, that (Injustice) Superman will be coming to Eternia, and their magical artifacts will be destroyed and stolen if deemed a threat to Supes reign. Speaking of the super-powered Devil (is that an oxymoron?) Superman's plans begin to take shape and we see he has some pre-crime technology being put into effect in his universe, with very deadly firepower, and the will to use it based on peoples thoughts and words alone. Superman's secret weapons are two-fold as he seems to be using a version as Batman as a Minority Report type pre-cog, while also having saved Skeletor at one point in his journey's, who's now become his loyal servant ... which only leads to benefit Superman, in a pretty niffy wrap around way, back from the beginning of this scene. As the wild and crazy conclusion starts we have the Sorceress give He-Man her blessing to pursue the mission on Earth that Batman asked of him. From there the heroes split into a couple teams and take off. However, there is a pretty HUGE two part cliffhanger with part I being a death, part II being the issues big reveal I didn't expect to come, and I cant spoil here. I'm going to say this though if you are on the fence about this issue don't hesitate, dive right in, this was a blast, and I need more now! Overall, whether you have a history with the Injustice and He-Man Universes or not, this book is a good time, that is setting up a very entertaining comic book story. I was super excited to see that these Masters of the Universe mini-series have their own little continuity callbacks they're following, which provide a bit of stakes to the story, I personally really dug. Tim Seeley tells a well paced story overall that had my attention from start to finish and I'm excited to see where this goes. If I had to nitpick with one complaint it would be the story is a bit on the nose, as far as driving certain obvious 'these things are bad' points home, but nothing that really affects my enjoyment level too much at all. There's not much bad you can say about the work Freddie E. Williams II & Jeremy Colwell put into this issue. Things look great, the colors pop off the page, and with plenty of action mixed into the events at hand it gives the guys plenty to be creative with. 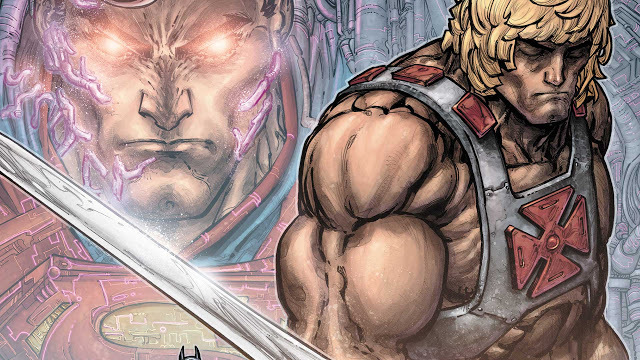 He-Man would look weird drawn and done by any other team at this point in comic form if you ask me. Injustice vs Masters of the Universe gets off to a very well paced start with some big surprises in store for fans of both parties involved here. 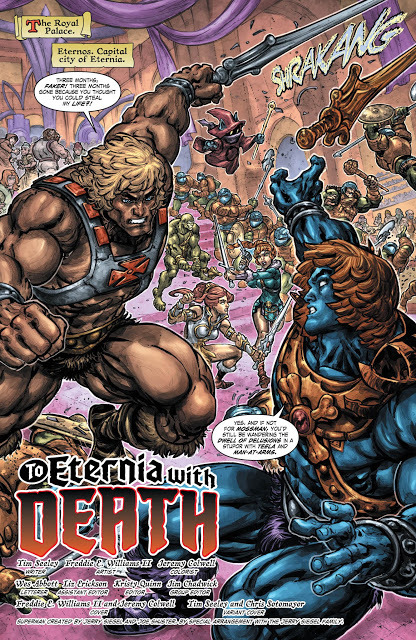 There's some shout-outs to past stories involving the other He-Man mini's, providing these series their own on-going continuity I personally loved, adding some stakes to the story. Plus with the art team of Freddie E. Williams II and Jeremy Colwell your visual senses are in for a treat. I definitely recommend this to anybody with a hole in their pull list. So this falls into the Superman Ending to Injustice 2. Superman wins and takes over the world with brainiacs tech and Ship. This also falls into the Masters of the Universe/Thundercats crossover as well. So now theres 2 Injustice continuities, the main one where Batman wins, and This alternate one where superman won. Hope he-man drops the sword and Batman picks it up to scream "by the death of my parents...I Have The Power." This was a good setup issue, art is not to my liking but it could be worse so I'm not complaining. See I love Freddie E Williams ... his Batman Turtles stuff is fun too. I really gotta catch up on Injustice 2 I have all the issues just need to binge it.